How to Succesfully Bathe Your Dog at Home! How to Successfully Bathe Your Dog at Home! We all like to have a clean smelling dog that shares our home and usually our bed too. 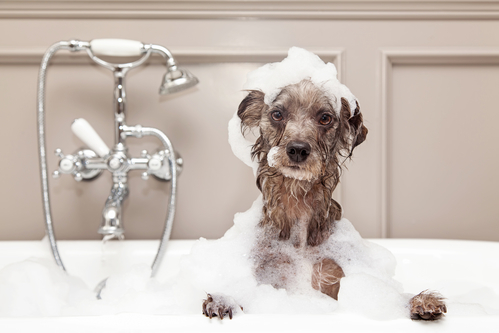 And, while you can always take your dog(s) to the groomer for a really good haircut and grooming, a bath is a simple and effective way to get your dog clean (and saves money too)! While not all dogs will allow us to bathe them at home, some dogs actually like it. If you try to make bathing a fun and positive experience, it can be rewarding and a good bonding experience! 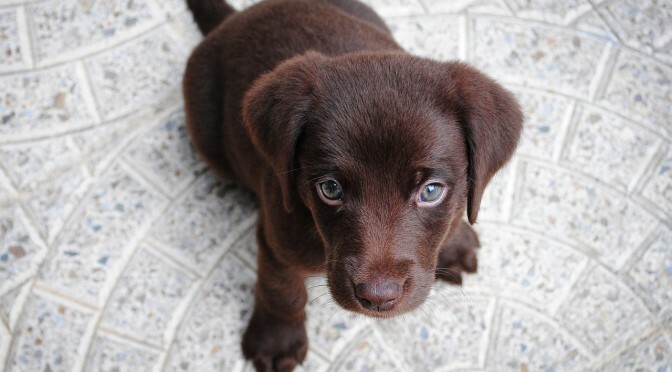 Start by taking your dog on a long walk so your pup is tired and more likely to cooperate. 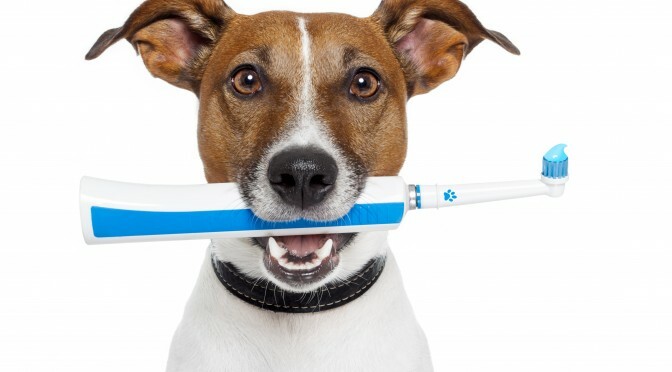 Always brush your dog first and do it thoroughly. Start brushing your dog’s coat and then move onto your pup’s neck, move down his body, under his belly, and on his tail. You can even use a human comb or hair brush. Stroke his coat gently with the brush to make the hairs lie flat. After, praise your dog and give him a treat for being a good sport. Make sure you to have everything you’ll need for the bath in advance: shampoo, conditioner, and towels should be within reach from the tub. Put a nonstick bath mat in the tub to keep your dog’s feet from slipping out from under him. Have the water temperature set to lukewarm for your dog’s comfort. Without saying a word, go and get your dog. Don’t call him to you; just make it a low key endeavor. With small dogs, just pick them up and place them in the tub. For big dogs, put a slip leash on your dog in a no-nonsense manner and lead him to the bathtub. Take the leash off and put him in the tub and start wetting your pup down with a gentle stream of water first. If your dog becomes agitated or fearful at any time during this process, your job is to remain calm and in control. Remaining cool and undeterred will show your dog that there’s nothing to fear and keep moving forward! Next get the shampoo on and start scrubbing like a massage! Start shampooing at the neck and move downward. Shampoos will always be easier to apply and rinse off if they are first diluted in water. We found this great Red Algae Infused pet shampoo by Petbiotcs, which smells great and works wonders! When you are shampooing a certain area, give it a few squirts and use your hand to spread the shampoo. Save the head for last and try to keep the shampoo out of their eyes for a more enjoyable experience. Thoroughly rinse your dog until all the dirt and shampoo is gone. Shampoo left in his or her coat can cause hot spots, an irritating spot of bald, itchy, red skin. Now drying off – the easier part ! 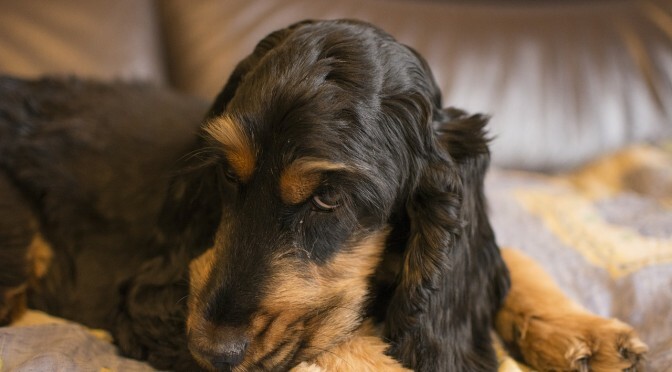 For dogs with long hair, try to blow dry his or her fur without completely drying him out. Make sure to praise and reward your dog after grooming him or her for being a good sport. 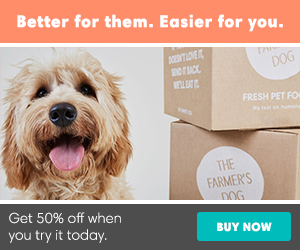 Give your dog a treat and his favorite toy to make the experience a positive one. While the tips above are seemingly straight forward, it all begins with your attitude. Most dogs love water which is why they take to swimming. So, once you bathe your dog once, the process should get easier the next time you bathe your pup for both of you! If you don’t have time to bathe your dog, try this great effective grooming spray, No Bath Probiotic Powered Pet Spray that will make your dogs’ smell great in-between baths! If you want to learn more about some great grooming products, click here!